For the first time in the 23-year modern history of Organizacion Miss America Latina, Inc., the representative from the United States has been crowned the new Miss Latin America 2006. New York attorney and reigning Miss Latina US Melissa Quesada bested delegates from countries in Latin America and Europe to bring the international title to the US. Melissa is a perfect reflection of the Latina women participating in our pageants. 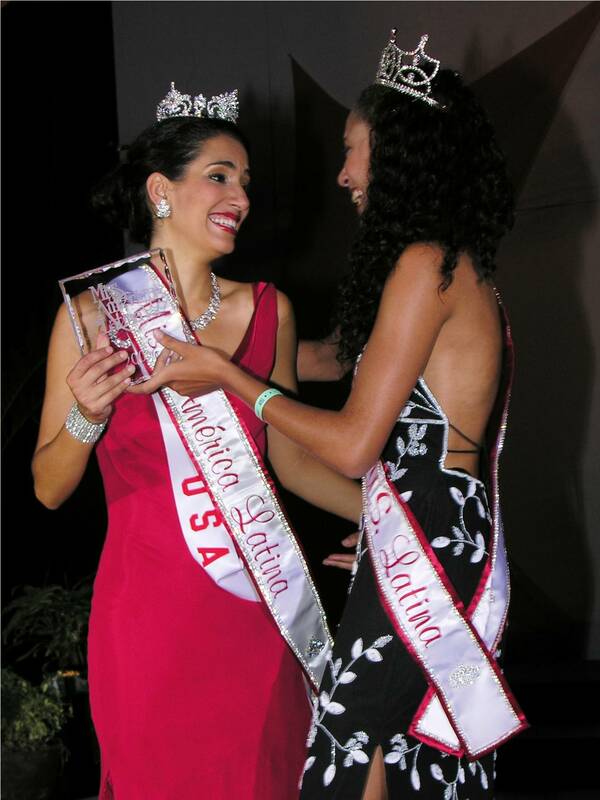 27-year-old attorney Melissa Quesada from New Rochelle, NY was crowned Miss Latin America® 2006 recently at the international pageant held at the Barceló Maya Beach Resort in Riviera Maya, Mexico. A total of 23 candidates from countries around the world competed for the title during the two-week long pageant extravaganza that featured Latin urban pop group C Note as guest entertainers. First runner-up was Neolida Hernandez from the Canary Islands and second runner-up was Xiomara Blandino from Nicaragua. Completing the top five finalists were Guatemala's Catherine Gregg and Brazil's Geise Pousa. Other delegates making up the top 12 semifinalists spots were Elisa Abreu of Dominican Republic, Lissa Saenz of Honduras, Silvia Masso of Catalunya, Liz Cardozo of Paraguay, Libni Garcia of Puerto Rico, Esther Perez of Spain, and Arianna Ramirez of Mexico. This is the first time in the 23-year modern history of Organizacion Miss America Latina, Inc.'s production of the worldwide pageant that the delegate from the United States has won the international title. Miss Quesada's exotic good looks go hand-in-hand with her intellect, as evidenced by her scholarly accomplishments: an Honors Scholarship from Hofstra University, she was selected to represent her School of Law at a competition on Trial Techniques Litigation sponsored by the National Hispanic Bar Association in Albuquerque, New Mexico, BMG Music Legal Scholar, Radio City Music Hall Education Scholarship, and National Honor Society; she received her Doctorate in Jurisprudence from the prestigious Hofstra School of Law last year and is currently a J.D. Associate at a New York Law Firm focusing on Entertainment Law. She is fluent in Spanish and proud of her Puerto Rican Heritage, which she demonstrated when she was selected National Puerto Rican Day Parade Cultural Ambassador in New York. According to Acirema Alayeto, President and Founder of Organizacion Miss America Latina, Inc., which produces Latina pageants worldwide, "Melissa is a perfect reflection of the Latina women participating in our pageants." Recently, the organization conducted a profile of the interest, lifestyle and aspirations of the young ladies participating in recent pageants. Alayeto said: "Our findings reflect a new generation of Hispanic women evolving in the United States. Melissa's winning the first international title in our system is a strong reflection of this." Over half were born in the United States. The average age of the participant was 20.9 years. Ninety (90%) percent are either attending college, working on a professional degree; or have graduated from college. 3.38 is the grade point average of those attending or have graduated from college. Communications, Journalism and PR; followed by Psychology and Sociology and Business, Government and Political Science are the leading majors. Sixty (60%) are working while in college. Sales are the leading job category. Ninety (90%) percent are bilingual in English and Spanish. Twenty-three (23%) percent speak a third language. The inherent attitude noted in the study was that the current generation of young Hispanic women, especially in the United States, is: Ambitious, Proud, Accomplished, Ready, Educated and Latina. "We call it the APAREL (using the first letter of each word) ATTITUDE," Said Alayeto. During her year of reign as Miss Latin America®, Miss Quesada will embark on a national and international tour of appearances and speaking engagements reflecting her accomplishments and the role of young Hispanic women in today's society. She will crown her successor to the US title on Friday night, September 29, 2006 at the MISS LATINA US™ Pageant being held as a part of the entertainment and cultural program of one of the largest and oldest annual events in the Northeast, the Eastern State Exposition known as the BIG E in West Springfield, MA. Organizacion Miss America Latina, Inc., based in Miami, FL, is the oldest and largest producer of Latina pageants worldwide. Beginning in 1981, founding President Acirema Alayeto created an international pageant system where Latin American women from around the world annually compete for the title of MISS LATIN AMERICA®, best known worldwide as "MISS AMERICA LATINA®." The company also produces the annual MISS LATINA US™ and MISS TEEN US LATINA™ national pageants. The MISS LATINA US™ Pageant was developed in the United States to recognize the personal and cultural attributes of young Hispanic women beyond their physical beauty. For Latina woman in the US, this program represents a chance to compete in a non-traditional pageant that welcomes their identification with their Hispanic ancestry. It awards them the opportunity to win on their own merits, without regard to their ethnicity. To the contrary, their ethnicity is celebrated. The crowned MISS LATINA US™ advances to represent the United States at the next MISS LATIN AMERICA® international pageant. Top 3Melissa Quesada of USA in center, with First Runner-Up Canary Islands on left and Second Runner-Up Nicaragua on right of photo. Miss & TeenMiss Teen US Latina Geysha Gonzalez hands winner's trophy award to new Miss Latin America Melissa Quesada. MelissaMiss Latin America 2006 Melissa Quesada CoronationMelissa Quesada is crowned Miss Latin America 2006 by her predecessor Mariela Candia of Paraguay.